On the verge of the fantasy football playoffs, BetChicago thought it best to look ahead to the best quarterback fantasy playoff matchups, and those stars who are going up against brick walls. Weeks 14, 15 and 16 of the NFL season - generally regarded as the three rounds of the fantasy football playoffs - are some of the most intense days of the sporting calendar and finding the best quarterback fantasy playoff matchups can be key. Friends become enemies. Contenders are separated from pretenders. Thousands of dollars change hands because of guys like Tim Hightower. Or, this year, Spencer Ware. As we look ahead ahead to see which quarterbacks face the most lenient defenses in fantasy football during the playoffs, and how that could affect their - and your - best players. We'll also explore which players face the stiffest competition, so you can plan ahead as needed. __More football:__ [Week 13 betting recap](https://www.betchicago.com/nfl-week-13-betting-bad-beats-upsets-crazy-finishes) ## The Formula Using Yahoo's fantasy points against rankings, we break down the players' Week 14, 15 and 16 opponents. Then we multiply per round: X1 for Week 14, the quarterfinals; x2 for Week 15, the semifinals; and X3 for Week 16, the championship round. The lower the score the better. # The Easiest Path ## Cam Newton, Panthers QB: 29 __Week 14:__ Browns (15) __Week 15:__ Saints (4) __Week 16:__ Falcons (2) Newton has a beautiful path ahead of him, and his fantasy football owners should be drooling. The Saints and Falcons? It doesn't get much better than the fourth and second-worst defenses against opposing quarterbacks. 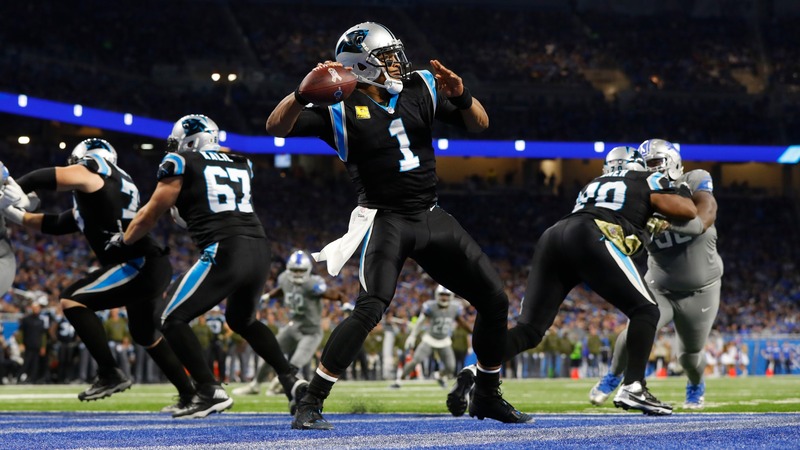 Newton has been terrific throughout the season, throwing for multiple touchdowns in 10 straight games and scoring more than 25 points in eight weeks already this year. He could very well surge to second in the points standings behind Patrick Mahomes. Given his finals matchup against the Falcons, its no surprise he's got the clear-cut cleanest path toward fantasy success. This bodes well for Newton's passing game targets, particularly Christian McCaffrey. ## Josh Rosen, Cardinals QB: 37 __Week 14:__ Lions (9) __Week 15:__ Falcons (2) __Week 16:__ Rams (8) Not a viable fantasy starter by any means, but perhaps Arizona's wide receivers - Larry Fitzgerald, really - and David Johnson should get a bump. ## Ben Roethlisberger, Steelers QB: 43 __Week 14:__ Raiders (11) __Week 15:__ Patriots (10) __Week 16:__ Saints (4) Roethlisberger, like Newton above, benefits from an NFC South matchup with the Saints. Especially with it coming in Week 16. Obviously that trickles down to the super twosome of Antonio Brown and JuJu Smith-Schuster. ## Dak Prescott, Cowboys QB: 43 __Week 14:__ Eagles (2) __Week 15:__ Colts (16) __Week 16:__ Buccaneers (3) With the Eagles and Buccaneers sandwiching a middling Colts defense, Prescott and Amari Cooper should form a nice playoff connection. Prescott hasn't always taken advantage of big matchups - he put up just 16 points in Week 13 against New Orleans and just 14 in Week 11 against Atlanta - but with the Buccaneers coming up in championship week, he might be the difference between a title and second place. ## Baker Mayfield, Browns QB: 44 __Week 14:__ Panthers (5) __Week 15:__ Broncos (18) __Week 16:__ Bengals (1) Mayfield had a career day on Sunday, in both good and bad ways. The No. 1 pick was picked off three times in the first half against the Texans to mask his 397 passing yards. He now has 10 interceptions on the season. He also has two premium matchups in his last three games. Can you imagine starting a rookie in the championship week? Just maybe. ### Drew Brees, Saints QB: 52 ### Russell Wilson, Seahawks QB: 61 ### Mitchell Trubisky (or Chase Daniel), Bears QB: 63 ### Josh Allen, Bills QB: 67 ### Derek Carr, Raiders QB: 69 ### Case Keenum, Broncos QB: 70 ### Jameis Winston, Buccaneers QB: 70 ### Deshaun Watson, Texans QB: 90 ### Matt Ryan, Falcons QB: 92 ### Aaron Rodgers, Packers QB: 93 ### Philip Rivers, Chargers QB: 94 ### Andy Dalton (or Jeff Driskel), Bengals QB: 98 ### Joe Flacco (or Lamar Jackson), Ravens QB: 105 ### Eli Manning, Giants QB: 106 ### Cody Kessler, Jaguars QB: 110 ### Marcus Mariota, Titans QB: 111 ### Carson Wentz, Eagles QB: 114 ### Kirk Cousins, Vikings QB: 115 ### Jared Goff, Rams QB: 124 ### Ryan Tannehill, Dolphins QB: 131 ### Colt McCoy, Washington QB: 132 ### Sam Darnold (or Josh McCown), Jets QB: 133 # The Hardest Path ## Tom Brady, Patriots QB: 142 __Week 14:__ Dolphins (20) __Week 15:__ Steelers (13) __Week 16:__ Bills (32) Touchdown Tommy is showing some age this year, and his status as a top-five fantasy option is now in question. But during championship week, there is no question: You can't start him. Buffalo has eaten up opposing quarterbacks, including holding Brady to no scores in Week 8. ## Andrew Luck, Colts QB: 143 __Week 14:__ Texans (25) __Week 15:__ Cowboys (23) __Week 16:__ Giants (24) Are we watching Luck's undoing? In other words, does the Luck stop here? The Colts' star has been incredible this year, but had his first major hiccup in about two months on Sunday against Jacksonville. With three very good but not great defenses coming up, he's in for a rocky road. ## Nick Mullens, 49ers QB: 154 __Week 14:__ Broncos (18) __Week 15:__ Seahawks (26) __Week 16:__ Bears (28) It's not as if you're starting Mullens anyway, but George Kittle and Co. might deserve a bump down with a pair of monsters in the semifinals and finals. ## Patrick Mahomes, Chiefs QB: 167 __Week 14:__ Ravens (27) __Week 15:__ Chargers (31) __Week 16:__ Seahawks (26) The honeymoon may be over for the Chiefs' dominating quarterback. The gauntlet ahead is perilous come the playoffs, and the Ravens-Chargers-Seahawks 1-2-3 punch may prove too much to overcome for fantasy owners who've ridden Mahomes' hot hand throughout the season. ## Matthew Stafford, Lions QB: 181 __Week 14:__ Cardinals (30) __Week 15:__ Bills (32) __Week 16:__ Vikings (29) If you haven't bailed on Stafford yet, now is the time. There's no helping here.